TRIVIA of Noh : Q110 :Does each school have its own design patterns for the fans? | Home | Trivia | Q110 : Does each school have its own design patterns for the fans? Does each school have its own design patterns for the fans? There are two major types of folding fans used in Noh – the chūkei carried by shite and waki actors, and the shizume-ōgi carried by dancers, singers, musicians, and kōken (assistants). Each Noh school has its own design patterns and structures for the shizume-ōgi used in dance and solo performances. The Kanze school uses fans decorated with three layers of whirling water, the so-called kanze-mizu (Kanze's water). These fans have semi-cylindrical round heads, and the guard on each side has three sections of openwork. 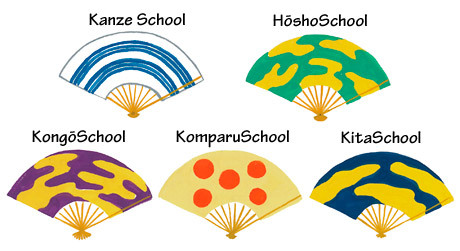 The Hōshō school uses fans decorated with five clouds. The end of the sticks around the rivet is roundish and relatively small. The Kongō school is known by another name, "Mai-Kongō", indicating its focus on dance. Its fans have characteristic gorgeous patterns such as kongō-un (clouds) and kuyōsei (nine circles, symbolising stars). The end of the sticks is angular and rather imposing. The Konparu school uses fans decorated with five circles (called "five stars") on a plain background. The sticks are straight without any decorative shapes. The Kita school uses fans decorated with three clouds. The cross-section of the sticks is semi-cylindrical, so you see a rounded shape when the fan is pointed at you. Fans used for practice are generally decorated with single-colour patterns on a white ground. On the other hand, those used for performance are decorated with multi-colour patterns on a gold or silver background, with gold or silver patterns on a coloured background, or with different types of characteristic features. A solo dance is performed in a plain-crested kimono and hakama trousers, so you will not see colourful costumes. It may be interesting, however, to pay attention to the fan spicing up the performance.